If you are looking for an upright exercise bike then Marcy NS652 is perfect for you and your family members. It made of some great features at a low price. Before buying the bike read this Marcy NS652 review. It has a monitor to display your performance. You can read distance, speed, time, calories burned and also odometer. This exercise bike uses magnetic resistance system. It has eight levels of resistance and also adjustable. So you can adjust the levels from easier to difficult. The pedaling is so quiet and smooth. So you can listen to music or watch TV when exercise. 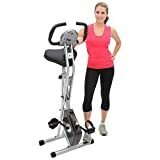 Marcy NS652 cardio workout does not take more places when you exercise due to its small dimension. So you can easily exercise in your room. You can also fold this bike. So you can storage it after finish your exercise. Its made of very strongly. So, It can hold up maximum 250 lbs user weights. The seat has high-density foam padded and also adjustable. It’s comfortable for you and also your family members. A 2 inches LCD monitor includes this Marcy NS652 exercise bike. With this LCD monitor you will be able to read your distance, speed, time, calories burned and also odometer. The monitor displays accurate measurements. When you start to exercise, the monitor will turn on automatically and also display your progress. But when you stop exercise, the monitor will turn off automatically after 5 minutes due to saving energy. If you press MODE key, it will automatically scan for every 4 seconds. This Marcy NS652 machine makes with magnetic type resistance. Marcy Foldable exercise bike designs with 8 levels resistance control system. The resistance levels are adjustable manually. So, you can adjust the resistance levels from easier to challenging. The pedals have straps so that you can safety from any slippage. You will not feel any disturb when exercise. You can easily listen to music or watch TV when exercise. When you exercise, the Marcy NS 652 does not take large space. Due to its dimension, this exercise bike takes small space of your room. The dimension of this bike is only 32 inches (L) x 18 inches (W) x 42 inches (H). Weight is only 37 lbs. This exercise bike is also foldable. Its foldable dimension is only 14 inches (L) x 18 inches (W) x 51 inches (H). After finish your exercise you can easily store this bike in your room. This Marcy NS-652 designs with a high-quality frame. It is very sturdy so that you can exercise with safety. Marcy Foldable exercise bike constructs with 14 gauge steel and also a durable gloss finish. This exercise bike can hold up maximum 250 lbs user weights. The Marcy NS652 workout has a large seat due to your comfortable exercise. The seat designs with high-density foam padded and also adjustable for different members of your family. You can adjust the seat very quickly. The seat has 5 different height positions; 33- 36 inches. The seat is very comfortable. This bike has handlebars due to your comfortable exercise. Q: Is this item refurbished? A: No. Everything I sell is brand new, factory sealed in a retail box. Q: Is this good for weight loss? A: Yes. The faster you pedal the more calories and fat you burn off. Therefore your weight will lose. Hope this bike will help you after about a month or two of regular use. Q: Is the Marcy NS652 easy to assembly? A: Yes. This bike comes with the necessary tools and clear instruction. It is very easy to assemble without others lead. Q: Is this exercise bike quiet? A: Yes, honestly it’s very quiet as well as very smooth, stable, and comfortable. I am very impressed with the great design. Q: What are the exact dimensions when folded it? A: Folded dimensions: 14 L x 18 W x 51 H inches. Q: Does the seat adjust easily to a comfortable position? A: Yes. There are 5 different height positions to adjust the seat. It is very smooth to adjust the seat to your comfortable position. Here is no complaint about it. Q: Could you use the bike on a carpeted floor? A: You can use the exerciser on a carpet, but it is better to place a mat under the machine. Q: Does this bike go to zero resistance or only down to level one? A: First resistance level of this bike is one and the number is really very easy as no resistance. Q: Does this hurt the knee and/or knee joints? A: Not at all. This bike actually helps your joints. Q: Is its functional easy? A: Yes. Its function is very easy. Marcy NS652 is a very effective exercise bike. In conclusion, Marcy Foldable exercise bike is a great exercise bike. Its price is very low. Customers have many positive reviews and its rate is high. You and also your family members will please by using this bike. Hope you will happy with this great upright bike. It has multiple levels of resistance with adjustable. The resistance is magnetic. The monitor displays distance, speed, time, calories burned and also odometer. The seat is adjustable and also comfortable. Its dimension is very low. You can also fold this exercise bike for storage to finish your exercise. It’s made of very strongly. So it can hold high user weights.